Hello world! Sam here as a 50% of this endeavoring road trip team: I'd like to take this moment to reflect on the fact that this is the beginning of the online representation of this trip. I'm pretty darn excited about getting on the road, so we decided to accompany it with some sort of online travel diary. So let's just call this my introductory/test post. I'll be trying out some of my humor in text version. If it doesn't work in the written form you should complain to any of the people that would tactfully snicker at my jokes when I told them in person. They encouraged me. Without resorting to undue hyperbole, I think I can say that this winter has certainly been snowier than any in recent memory (I think I saw some statistics comparing snowfall too, but I'm too lazy to find them right now). Which brings us to Saturday, easily one of the nicest Saturday's in recent memory. So like most everyone else, we took the wonderful weather (almost 70 degrees, in Maryland!) to get outside and to test our boots (really our stamina, but we're trying to keep up appearances). We decided to head out to the old C & O Canal National Historical Park on the Maryland side of Great Falls. 1. Holy moly first warm day = people get outside in droves! 2. It's a very different experience walking through a forest, that lacks all of it's foliage. 3. There are so. many. birds. From hiking/walking along the Virginia side of the Potomac River, I knew that people like to kayak and raft on the river (I actually, I think I remember seeing someone losing their paddle on the river a couple of years back). 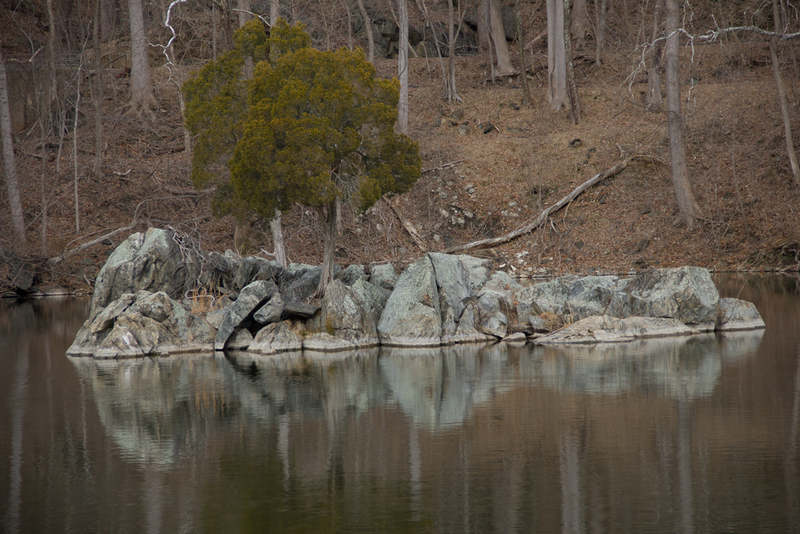 This time we were hiking along the Billy Goat Trail which is on the Maryland side, and saw lots of people on the water again as well as a rock climbing class, by the looks of it. Although the trail was pretty crowded, the Billy Goat Trail itself is moderately challenging. As a matter of fact, having grown up in the near vicinity of the Alps I am used to a very different more consistent (?) hiking experience and terrain. In this case, the trail is very versatile: starting out it's a soft earthen path in the woods, then it gets rocky, next it's sandy and soft. There are quick steep inclines and long even stretches. This all makes it a nice, interesting trail to hike, which presumably makes it so popular. Furthermore, you're accompanied by the Potomac (It seemed like the water was much lower than it had been recently because at a number of points we were walking well beneath branches of trees that still had drift wood and grass stuck in the branches) which by itself is fascinating sight. We stopped at little beach for lunch where I snapped a few more shots, including this obligatory one of Whitney with her lovely mother, Sue (who's been sheltering us, while we were homeless and preparing for the road trip. Thanks Sue!). After getting back on the trail, we finished off the Billy Goat Trail section of the hike and returned by way of the old towpaths along the original C & O Canal. My convincingly laid out and asserted rough guess at the age of the canal wasn't that far off (I figured it was somewhere between 1880 and 1920). It's nice to see a mix of maintained and weathered remaining infrastructure. Most prominent are the old locks, but there are also the remains of former structures that were part of the original operation. Almost back at the parking lot, they even had an old canal boat (the Charles F. Mercer). She was on blocks though, because of the low water lever in the canal. So there you have it. First completed writing assignment for Herr Herbig. Thanks for reading, and let me know what you think. P.S. There's a link to "PICS" at the top of the blog, that I'll try to keep up to date with our travel pictures.